The lion is the second-largest member of the cat family. The male weighs from 350 to 400 pounds. Some male lions can weigh as much as 500 pounds. The male lion is nine feet long from the tip of its nose to the end of its tail. They are 3 1/2 feet tall at the shoulders. The female lion is much smaller. They weigh only 250 to 300 pounds. Female lions are about one foot shorter than male lions. The male lion has a mane. A mane is a colourful with blond, brown or black hair. 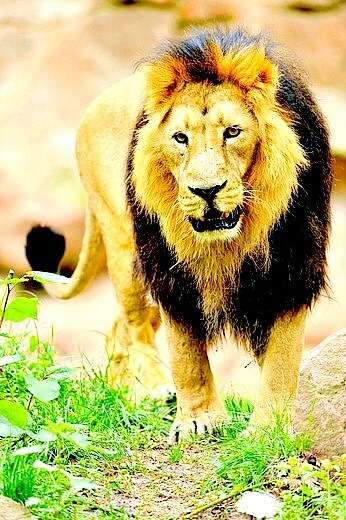 The long, thick hair covers the lion's head, except the face, and the neck down to the shoulders and chest. The lion's coat is a brownish yellow. Lions have muscular shoulders and forelegs.